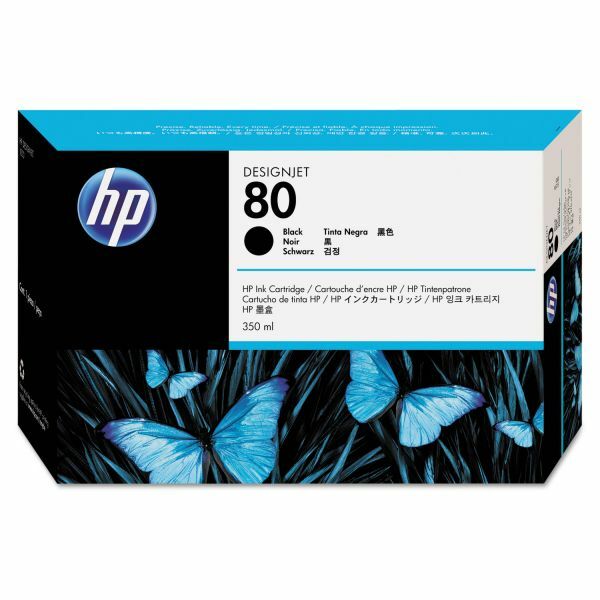 HP 80, (C4871A) Black Original Ink Cartridge - The HP 80 ink cartridges are designed to work with HP 80 printheads and printhead cleaners as part of a modular ink system. HP 80 ink cartridges are formulated to provide professional results that are always clear, always sharp. The higher capacity (350 ml) cartridge is ideal for high-volume, overnight, or unattended printing. And like the HP 80 printheads, the ink cartridges feature built-in smart chips to ensure excellent results without guesswork. The HP 80 ink cartridges are the perfect choice for users who produce precise black-and-color line drawings or high-quality color renderings, maps and graphics. Designed for use with Designjet 1050/1055 Series. Yields 4,400 pages. 4.50" x 2.20" x 8.90"